With Hurricane Irma aimed directly at Florida, millions of unprepared people are scrambling to make their way out of the danger zone as mandatory evacuations were issues throughout Southern Florida. Unfortunately, many have found themselves unable to leave as fuel shortages threaten the region. The only way to get out of the Florida peninsula is to drive northward, but residents trying to flee the storms wrath have found gas stations cordoned off with yellow tape, signaling they were closed due to lack of fuel. Over 40% of all gas stations in Miami-Fort Lauderdale and West Palm Beach were without fuel on Friday morning, according to estimates from crowdsourcing platform GasBuddy. Further North, Gainesville is experiencing an outage around 58% and 500 miles away from Miami, Tallahassee has over 20% of its gas stations experiencing outages. “You just have such incredible demand for gas right now as people pack up and leave,” said James Miller, director of communications for the Florida Petroleum Marketers and Convenience Store Association. 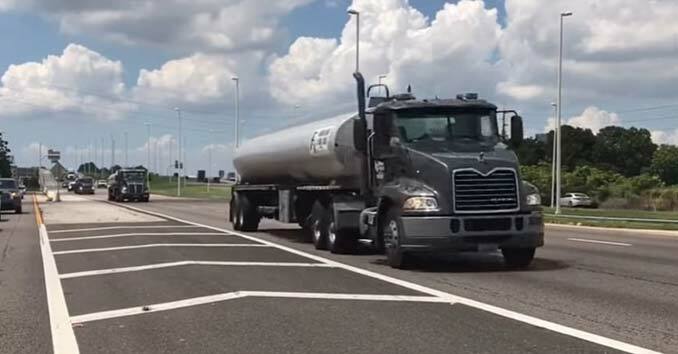 Gas trucks with Florida Police escorts have been making their way into Florida all week to try to help residents get gas to evacuate. ‘Please Go’: Florida Governor warns Residents To Evacuate Now! Florida Gov. Rick Scott Friday urged residents in the path of Hurricane Irma to “please go” as the massive storm is expected to hit on Saturday. S.FL- If you’re in an evacuation zone, LEAVE. @PortEverglades closes tonight & fuel can't be resupplied safely locally before Irma hits. Forecasters say Irma could slam into the Miami metropolitan area over the weekend, creating one of the largest mass evacuations in US history. Miami-Dade, Broward and Palm Beach counties are home to about 6 million people combined, many of whom are now stuck a traffic jam that stretched approximately 780 miles from Miami to Chattanooga, Tennessee. Two hurricanes back to back (Harvey and Irma) and two additional possible ones right behind them and yet people still do not learn. Preppers are NOT crazy but wise. I will not go into the climate change vs global warming debate because this is not about that right now. The issue at hand is we are having a bad year for disasters and the year is not over yet and people still look at us preppers like we are insane. Well while I have not been directly impacted by the hurricanes I still take the time to prepare for any possible disaster ahead of time. That’s not crazy just sensible. Yes, I agree prepping is very important. Unfortunately, you can only take “so much” with you plus, there are some that are on limitted month to month income and barely getting by, which makes it difficult to prepare. I have never run out of gas. I know someone who regularly runs out and gets stranded. This person puts gas in the car when it is almost empty. I was told never to let the fuel run too low because dirt sinks to the bottom of the gas tank. If you use the last drop of gas, that dirt gets into the motor. I feel good knowing my gas gauge is at full capacity. Most of the time I fill up when I have half a tank. If something was up like a hurricane coming in, I would make an effort to refill at every opportunity. I’ld have gasoline containers and at least one or two would be full at all times. The rest I’ld keep empty but ready to fill them if needed. Everyone finds what works best for their unique situation. I really don’t consider myself a prepper, but I have always tried to be responsible. Running out of gas because you didn’t bother to keep gas in your car is irresponsible. Waiting in line behind a hundred cars should teach someone to keep gas in your car even if you have to skip a meal. Running out of gas on your way to a fast food stop, that’s insane. Living in Florida as a prepper, this was my moment. No problem with supplies including food, water, fuel and ammo. In fact being prepared allowed me to help others. I chose to stay behind because of my well built cinder block home with steel hurricane shutters. The house is elevated and not at risk for flooding. I have a full tank of gas with extra gas cans in case I have to evacuate. We have a bag ready in the car. In Mother Nature, the fittest survive. My family will survive! Totally agree. Live in coral gables and had to bug out. Had everything ready from 30 days food and water to,supplies,for,dogs,and tactile gear. Staying with my mom and we are ready . It just astounds me that people are not prepared even with basic supplies. Have they been living under a rock? This hurricane has been predicted for days with media coverage being total and continuous. You have to feel that if we ever have a more serious SHTF situation people would be totally lost. I firmly believe based on viewing preparations for Harvey, and now Irma our infrastructure would collapse within the first day of a more serious country wide disaster. This is a sorry state of affairs for our country as a whole. I could not agree with you more. I know some family members who were trying to make me feel bad for my preparedness compared to others and I told them as real as it could get. We all live in the same city and state and knew what we were facing. While they are in lines for gas and water I was ready. Not 100 percent but leaps beyond others. When something major hits our country it is going to be all out war and everyman for themselves. We are not so crazy after all. Always ready to go with enough food(120 days), unlimited water(solar powered well) with enough solar left over to run the fridge and toys. It pays to live @ your bug out location. Yep. Stopped by the store to pick up a prescription that had been called in and shelves were bare. People were getting pretty angry. As we left with wife’s meds, I said bet your glad we have everything we need. She had a pretty big smile on her face.